for a replay counter step-up coil not powering - or not having enough power to pull in the plunger. the only unique part of that circuit is one wiper finger on the search disc. The problem is almost always cruddy rivets on the contact plate or poor wiper->rivet contact. The other possibilities are the coil itself or a different search disc/wiper pair is partially shorting and dragging down the voltage/current. the replay counter step-up coil stuck on problem separate post. 1] orange. 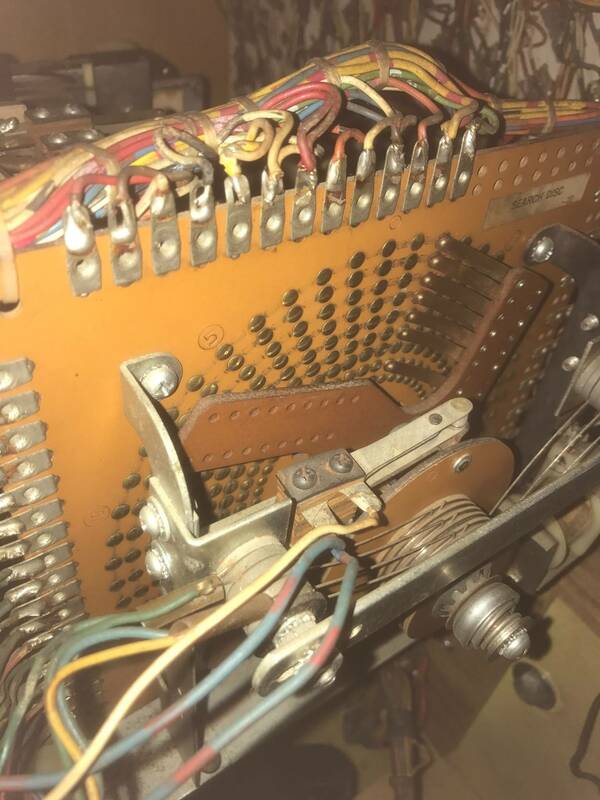 Wire 70 is connected to some coils and the bottom of CU 8 switch. 2] you've pushed the C button and the 3-4 search wipers spin around to position 41. 3] yellow. The yellow circuit path completes. The 3-4 search index coil is powered and stops the wipers at position 41. The top of the replay counter step-up coil is connected. 4] green. The 3-4 search index switch closes and connects the regular win relay. The search index coil is switched to power thru a resistor to reduce heat. The game is waiting for your double/nothing choice. 5] blue. You push the R button and the regular win relay powers. The replay cams index coils powered and the replay cams (under CU 7-10 switches) are released to spin. The alternate current path to CU 7 patch switch is closed. CU 10 switch is open most of the time while the replay cams turn, but a replay cams index switch keeps the yellow circuit closed. 6] purple. As the replay cams switch, CU 7 pulses the replay register to add credits. The cu 7 back switch also provides the redundant path for the high power solenoids (replay register and replay counter step-up) to prevent pitting of the replay counter printed circuit traces. 7] teal. CU 8 pulses at the same time the 4th credit is added to step up the replay counter. 8] red circles. If the replay counter has stepped off the active traces, the yellow circuit is broken. When the CU 7 back switch opens, the purple and blue circuits are open. The search index coil and replay cams index coil lose power. The search wipers are released. 9] win detect is inhibited until the replay cams spin around and lock home. That closes CU 10 again. the only way to stick on the replay counter step-up coil is as you mentioned...the teal circuit needs to have a closed path to the orange. since cards 1-2 work and the teal circuit is shared with them, the implication is there's something related to the 1-2 search wipers/contact plate that's providing a current path...hence the "stick paper under the wipers" test when the replay counter step-up coil is stuck on. the usual problem is a slip ring wiper in the wrong groove on the 1-2 search wipers or the search wipers aren't locked in the correct position. I thought you checked/fixed the locked position of the search wipers. If your pic in post 35 is where your 1-2 search wipers are locked, you're in trouble. 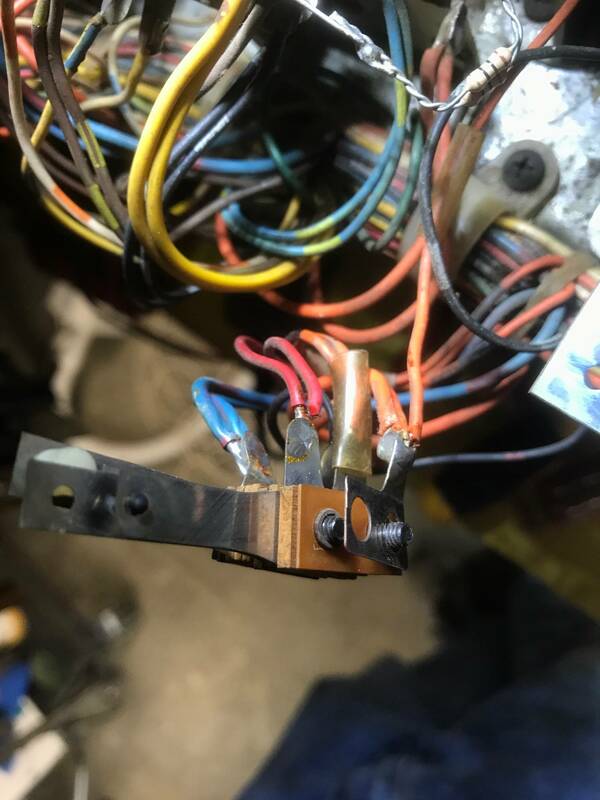 You will be creating a circuit path thru the 1-2 search index coil/resistor and replay counter #1 step up coil that would likely be good enough to hold in the solenoid plunger. 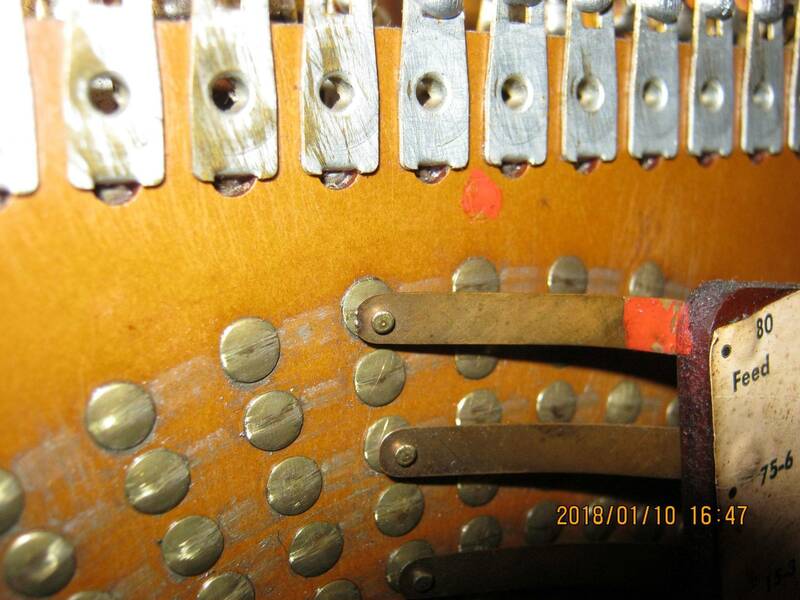 usually the 1-2 search index coil would power at the same time as the 3-4 when the wipers are locked in the wrong place (finger on the B rivet), but it is dependent on the resistances of the coils. Drinking my coffee now, and yes, I understood pretty much all of it. I had pretty much figured what you described but there were a couple of things you pointed out that I had not realized and will need to check. Thank you for the detail. I know it took some time to do it and I appreciate it. I use colored pencils on my schematic but that gets messy. 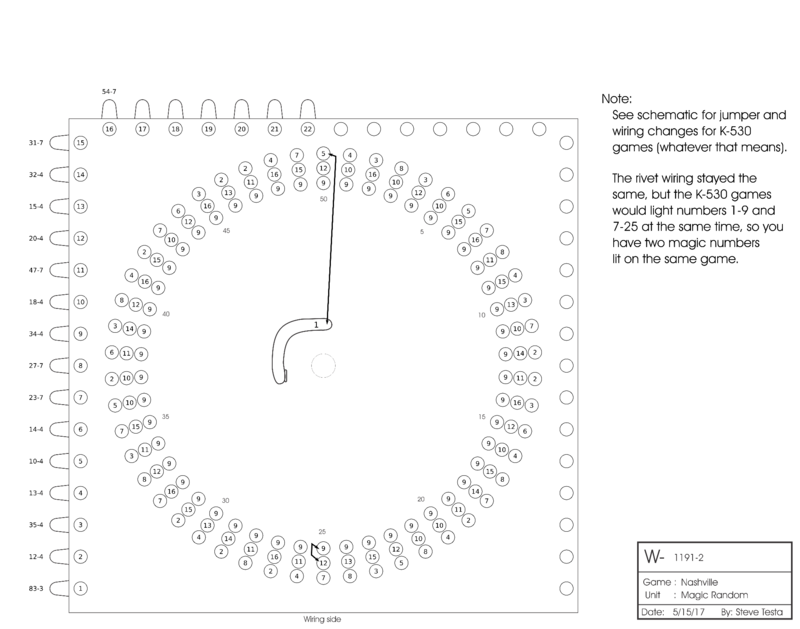 I need to find a schematic I can blow u and print. I have a .png one but have not figured out how to print it large in Windows. The other part of the circuit I do not completely understand yet is how the 5 search relays are picked by the search disks. They pick and drop and clatter while the search disc is spinning. I assume that is normal. 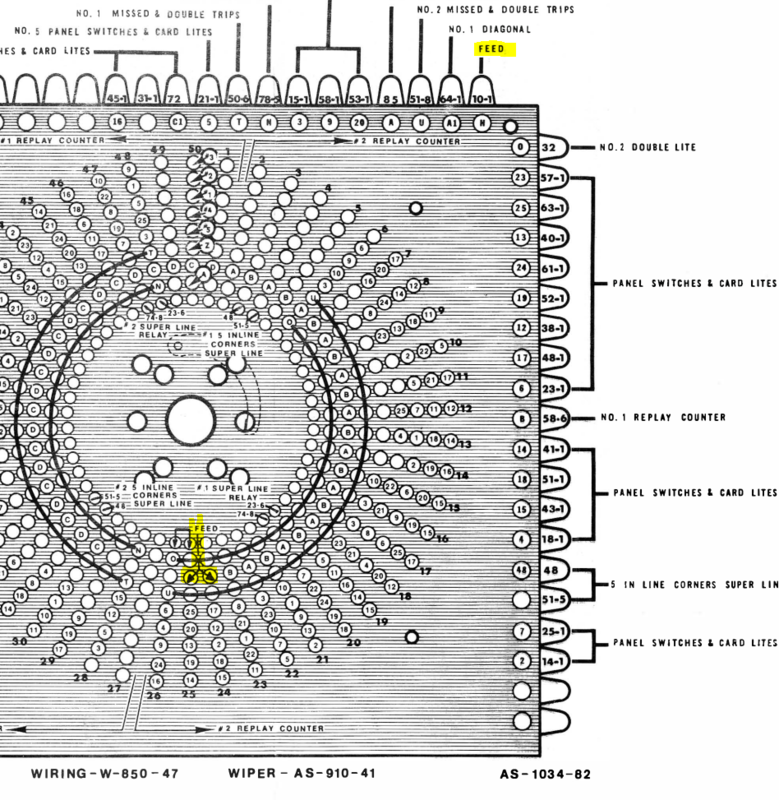 I understand the logic with the contacts themselves just not what rivets on the search disk that activates their coils. Thanks again for your detailed description, exactly what I needed. I will double check the home position for 1 & 2, it should be 49 but I have looked at these so much I could be just assuming. Slip rings are okay, I look at those every time I fiddle with something because I tend to bump them out of position. All 3 search disks home positions is 49. Slip rings are in correct positions. hehe. If the home position is 49, where would the highlighted wiper be? ... and where does that wiper go? I suppose the question would then be, why don't the 1-2 replay counter coils also stick on if the 3-4 and 5-6 wipers are locked on 49 also. Differences in coil and other resistances in the circuit are enough, I guess. take a look at the search positions charts in the manual (pages 16,19,20). the wipers scan from position 50/0 (hint for post 107 ) down, so the wipers traverse the chart from the bottom up. 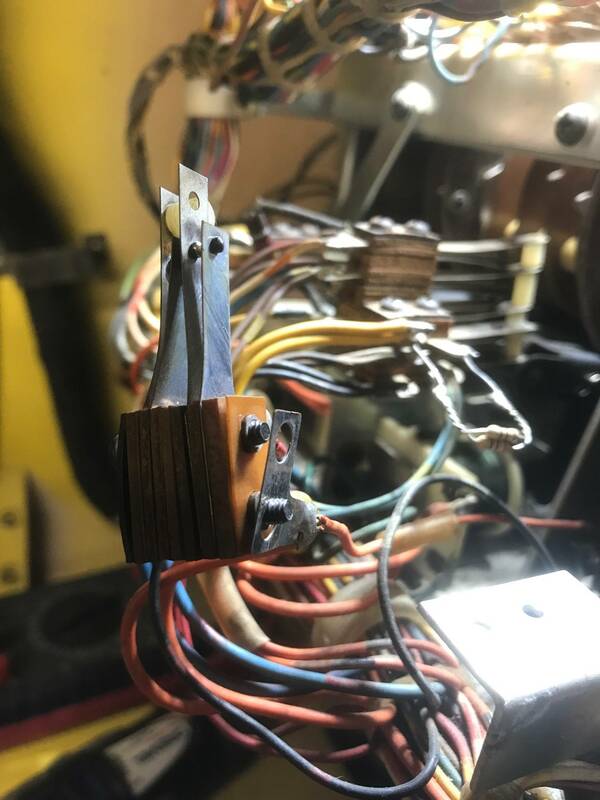 while the wipers spin clockwise, the contact plate diagrams for the search disc in the manual are drawn from the wiring side, so when looking at those the wipers would be spinning counter-clockwise. most of the manuals they tell you whether the diagram is the wiring side or the "button or wiper side"). The guy screwing up the late model machine manuals wasn't that nice. anyway, the chart shows what line/numbers are being checked at a wiper position, and the top of the chart says what search relay is powered for a lit number. That method works for all games. 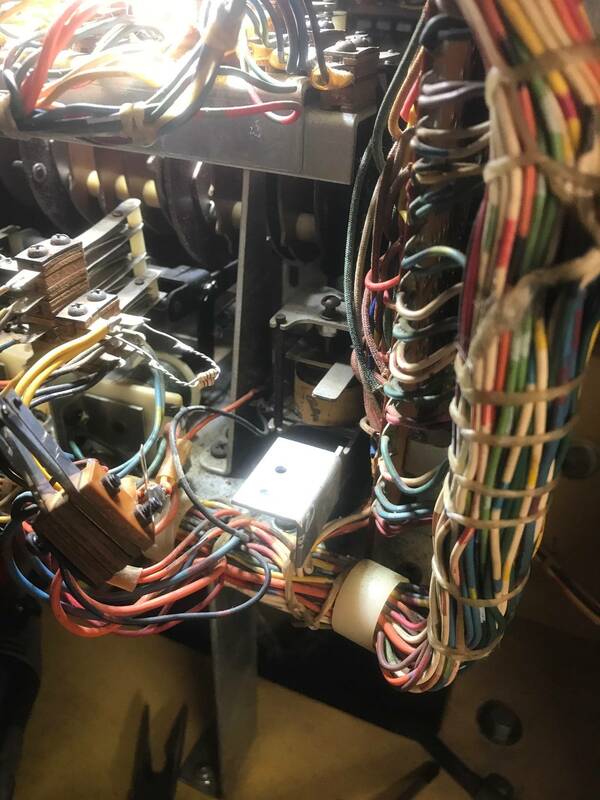 for some late model machines like Dixieland, the wipers that are tied to the search relay coils are indicated on the manual diagram with #1 - #5, and the rivets are labelled with the playfield hole numbers, so the chart is redundant ... but the chart is still easier to find the specific lines/diagonals on. wrt to viewing/printing a larger schematic on windows, I use the older windows photo viewer for viewing since the scroll wheel zooms. You can download it from msoft. printing you probably need to open the schematic in a image editor (like gimp) and resize/scale the image. Printing is usually based on the actual image dimensions, though I guess your image viewer could behave differently (e.g. it scales for you to match the zoom). You could also take screen shots and print those, but the resolution will be a lower. Okay, I need to know how I get the wipers home position to be 50 then. bingopodcast had told me that before but there just is not enough play in the bracket slots to get them there and I did not understand the significance of the other 2 wipers on the back that I never see, now I know. Is there a trick to it that I am missing? I found a free on-line convert to go from .png to .jpg which worked great then used Adobe to print it out at 500% over 12 11"x17" sheets, taped them together and now I have a huge schematic that my old eyes can see. is mounted, as well as the coil it's self(on it's own bracket), can be adjusted. Remember to make sure the contacts are right on the pin in the home position. well, he did say 50 in post 39. Later said 49 solves the lamp problem...which it does, but it leaves the potential for the problem you are seeing. 50 is the right position. If you can't slide the locking relay far enough to get them there, you have to see why (wear, etc.). You may be able to loosen the entire contact plate and twist it a little on the mounting brackets. don't forget that the switch stack sitting on the pin at the top of the locking cam needs to be lifted when the wipers are locked. The stack position is adjustable in a slot also. Could someone post a picture? I have fiddled with thesr enough and there is no room to adjust them to 50, or perhaps I don't really know where 50 is. I have filed the slots in the brackets to be as large as possible and still barely get to 49. 50 is where they need to be. 50 is marked with a 0 on the disc itself, or you can count five rivet sets away from #5 printed on the disc or #45. It's going to be basically straight out (pointing straight towards the backglass when the door is closed) on the two on the back door. I don't recall off-hand how it is physically oriented on the control unit disc. I think I mentioned that adjustment being tricky if the cam is worn. Basically the search magnet armature can deform that cam lobe over time. The adjustment available from Bally is really minute. So filing and then putting a backing nut on there is one way to take care of it. Basically, it'll have to grab the arms a little faster, so you need room to slide it forward (towards the backglass). Notice the RED dot. That/this is position 0. "0" = "50" same rivet! in position "1" . I have since moved this "locked"
Worth noting that Terry has a different game. Stick with 50. Thanks all. It is interesting that when I got the machine 1 was on 49 and 2 and 3 on 48. So just some fast fiddling before I had to leave and I think I can get 1 to 50 with just a little bit fuss. 2 and 3 are a different story, they are going to take some work. 3 is the worst both they both have some slop in them. When the disk with the cam locks you can move the wiper arms almost another full rivet, 2 has about half that slop. So, it looks to be a job to get to the inner part to see if tighening screws will fix it or if there is something else going on. Not sure I really want to disassemble the whole thing. My disks don't have dots, just the 0, 5, 10, etc. marks around it. I was sure of the 50 but a little baffled by not being able to adjust to it. Thanks to all of you, finally have Dixieland scoring correctly for regular win! Getting search disk to 50 for home position did the trick. I ended up taking the whole thing apart so I could polish the disk good and get to the relay. Enlarged the holes in the relay latch bracket to give more room for adjustment. Put it back together only yo find I had the latch cam 90 degrees off. Took apart, fixed that and put together only to find I now had the index pin on cam 11 off so took it apart again, fixed that and put it back together only to find I had something else wrong so took it apart again fixed that but broke a wire off for one of the wipers so fixed that and put it all back together and finally got it correct. Whew, that was fun, lol. 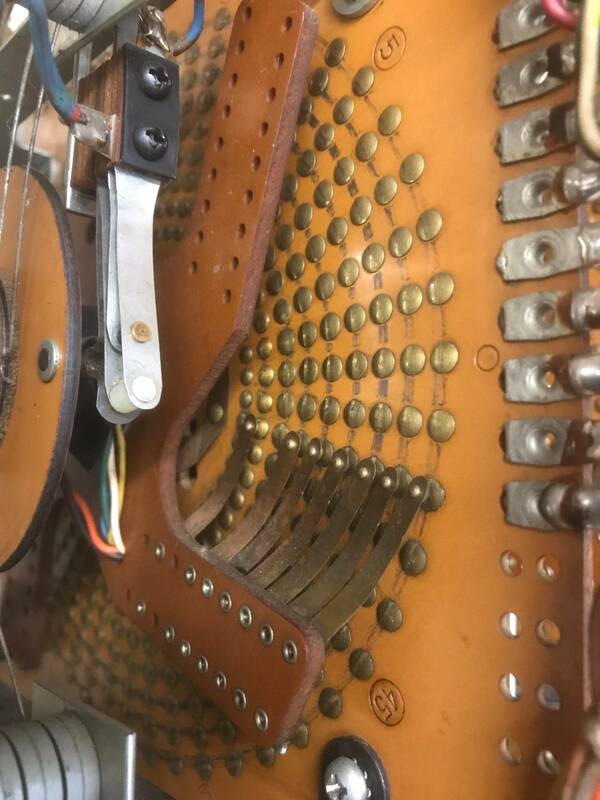 Still have search disk 2 and 3 sitting on 49, I just cannot get enough adjustment to get them to 50 no matter how big I make the adjustment slots in the bracket. But all disks score correctly for a regular win for 3, 4 and 5 in a row. Magic number works okay also. The D button does nothing so that is what I will investigate next. Also try to figure out what lights the 4 corner light and when. Thanks again for everyone's help. I have learned a great deal from you and I appreciate it all. Duh, 4 corners lit by the rollover button. That works too. send in a comment on that site if you want to suggest improvements to the material. the corners, corners rollover and super-line can enable randomly. If the rollover enables, then you have to hit the rollover button to cause the corners trip relay to trip. that function is done by the random disc at schem H18, and you don't know if something will happen until the shutter closes. also not in the manual are the magic random unit and the x2x2 random unit. there's a reasonable chance that two of those units are the same as used in Nashville, and steve testa did the hard work of making those diagrams - they are on the bingo.cdyn.com site and below. Nashville did not have an x2x2 random unit. if you ever get bored and want to get a better understanding of how the game works, let me know and I'll work with ya to create the diagrams for those units. Your part is "just" taking the wipers and contact plate off the unit frame and taking pictures. Those units don't have a huge amount of wiring on them, but if you are taking a picture and you can't really tell which rivets the wires go to, it's usually easy to bend some wires out of the way and take more pictures. send me the pics and I'll make the diagrams and post them for free download. if nothing else, good pictures of the unit showing the wire colors on the lugs helps determine if the units could be the same. 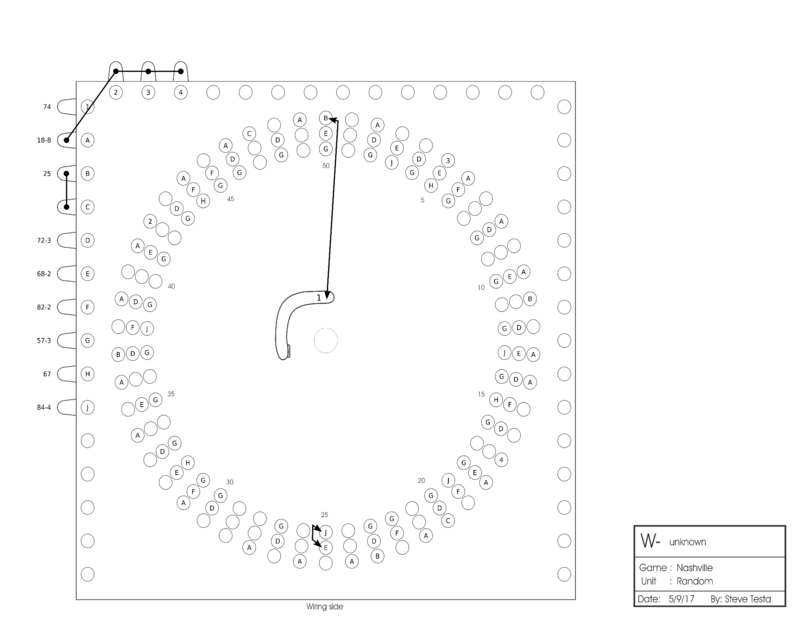 below are the Nashville diagrams. Thanks for the info. 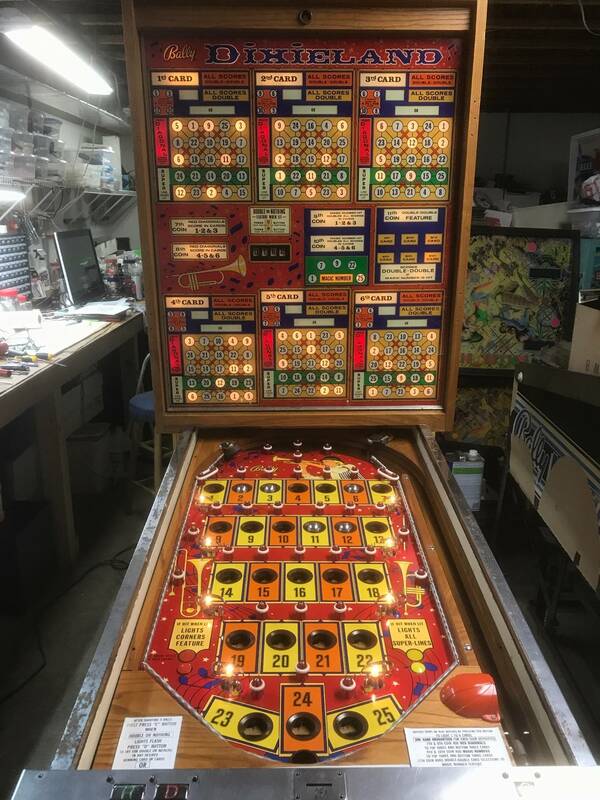 I don't think I will be bored for a couple years with the 3 bongos and 30 some pinballs to get going but would like to help out. Now that Dixieland is working I am just going to do a little more testing and then button it up and play it awhile. I do have a second Dixieland in storage though. Have not yet decided to dig it out and get it going or just keep it for parts. I could take the disks off that and take pictures if that would be any help to anyone. The double not working issue was simply the regular button was not adjusted correctly and the NC contact on it was open. Adjusted that and it works fine, although it doesn't pay the double very often so far, lol. I only have 3 more working days left before retirement and those are in the middle of April so I can grab the disks just about anytime. I will try to get that done next week. that write-up is mixers, but the pictures needed are the same. key thing is to make sure enough wire is visible on the edge lugs to id the wires. I look at the schem and the picture to figure out what wires are attached. if you can keep stuff disassembled for a day in case there's questions about where the spaghetti wire goes, that's great too. In this case, tho, the spaghetti is probably pretty easy to see and won't have buried wires. the diagrams are very helpful for people with hacked up games and the guys making computer versions. So what is the best way to get the pictures to you? I took a number of photos hi-res. 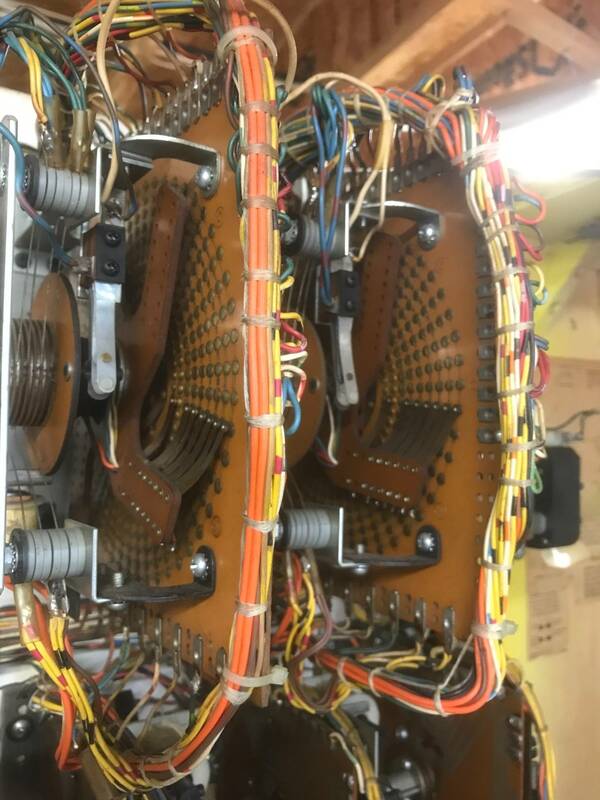 BTW, the spaghetti wiring is a mess, I tried moving some around but it is just a big mass, I am sure you will have questions and need some verification so I left it all apart. anyone can use bingopics@cdyn.com ... at least until I turn it off for excessive spam. if you want access to a cloud drive directory/folder, pm me and I'll create one and send you a link.